UNITED NATIONS, Oct 2 2015 (IPS) - At least ten million of the poorest people face food insecurity in 2015 and 2016 due to extreme weather conditions and the onset of El Niño, Oxfam has reported. In Oxfam’s new report called Entering Uncharted Waters, erratic weather patterns were noted including high temperatures and droughts, disrupting farming seasons around the world. Countries are already facing a “major emergency,” said Oxfam, including Ethiopia where 4.5 million people are in need of food assistance due to a drought this year. Almost three million face hunger in Malawi as a result of erratic rains followed by drought. These conditions have caused a stifling in food production and a rise in food prices. Christian Aid reported that the production of maize, Malawi’s staple food, has dropped by 30 percent in 2014, while maize prices have risen between 50 and 100 percent. Central American farmers have been coping with a drought for almost two years, also disrupting its maize production and decreasing access to sufficient food. 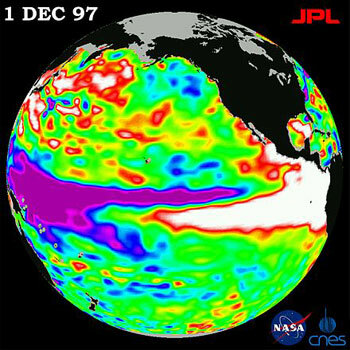 El Niño is a weather phenomenon where there is periodic, but prolonged warming of the Pacific Ocean. This can last between 9 months to 2 years, producing below-average rains and high temperatures. El Niño has already reduced the Asian monsoon over India, potentially triggering a prolonged drought and food insecurity in the Eastern region of the continent. The warming of the oceans, exacerbated by climate change, may double the frequency of the most powerful El Niños, Oxfam says. The charity urged for preemptive action, pointing to the consequences of failure of response, such as the death of 260,000 during the food crisis in the Horn of Africa in 2011. Christian Aid has also reported funding deficits in Malawi of over 130 million dollars, hindering support to the worst-affected communities. “If governments and agencies take immediate action, as some are doing, then major humanitarian emergencies next year can be averted,” Oxfam said in its report. “Prevention is better than cure,” they continued. The Oxfam report comes a week after the adoption of the Sustainable Development Goals (SDGs), which includes commitments to eradicating hunger and addressing climate change. They described the unfolding crisis as the “first test” for world leaders who will be meeting in December for the United Nations Climate Change Conference in Paris. “This should serve as a wake-up call for them to agree a global deal to tackle climate change,” said Oxfam Great Britain’s Chief Executive Mark Goldring.